While nanopositioning systems are not quite commodities, yet, they have made the transition from exotic "toys" for research to well accepted tools for manufacturing, test and inspection in all high-tech industries. When PI engineers designed nanopositioning systems with higher and higher precision they learned that in today's demanding applications better resolution alone does not solve the customer's problem. NanoAutomation® takes nanopositioning to the next level. It defines solutions that perform exceptionally well in real world applications improving speed, stability, throughput and quality. NanoAutomation® means achieving nanometer and sub-nanometer level precision faster, reapeatedly. This philosophy optimizes all parts of the nanopositioning system with respect to the individual application. NanoAutomation® is the result of thousands of nanopositioning solutions designed in the last 40 years. Benefits: Lower inertia, smaller footprint, no moving cables, superior dynamic behavior, active multi-axis trajectory control on a sub-nanometer level. 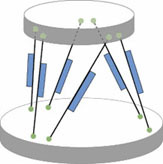 Serial-Kinematics "Stacked" Stage 6 DOF MicroPositioning System (L) and Parallel Kinematics Hexapod Robot 6 DOF MicroPositioning System (R). 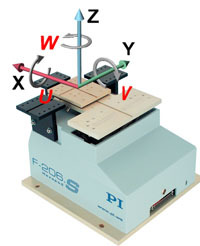 Six-axis parallel kinematics drive principle of F-206 hexapod. 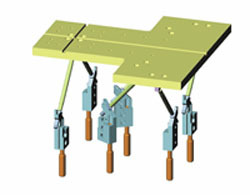 The parallel kinematics design with constant-length struts reduces the moved virtually to that of the light-weight platform. This is why the F-206 can react and settle significantly faster than stacked serial kinematic systems.